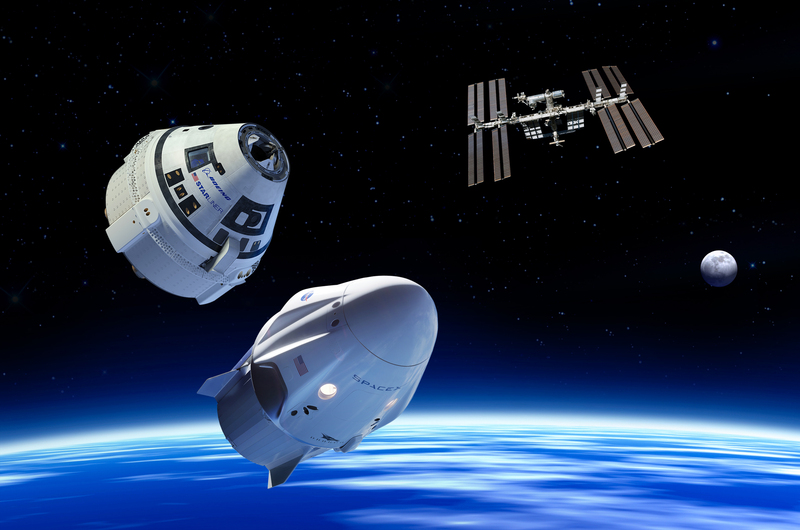 NASA and Boeing are nearing the final stages of development and evaluation for crew systems that will return human spaceflight launches from American soil on missions to the International Space Station as part of the agency’s Commercial Crew Program. To meet NASA’s requirements, the commercial providers must demonstrate that their systems are ready to begin regular flights to the space station. 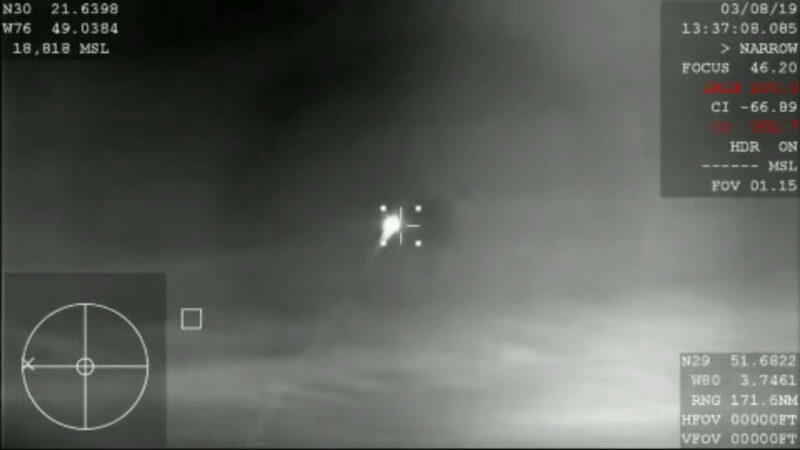 Boeing now is targeting the company’s uncrewed mission, called Orbital Flight Test, in August 2019, although this is a working target date and to be confirmed. The CST-100 Starliner will launch atop a United Launch Alliance Atlas V rocket from Space Launch Complex 41 at Cape Canaveral Air Force Station in Florida. 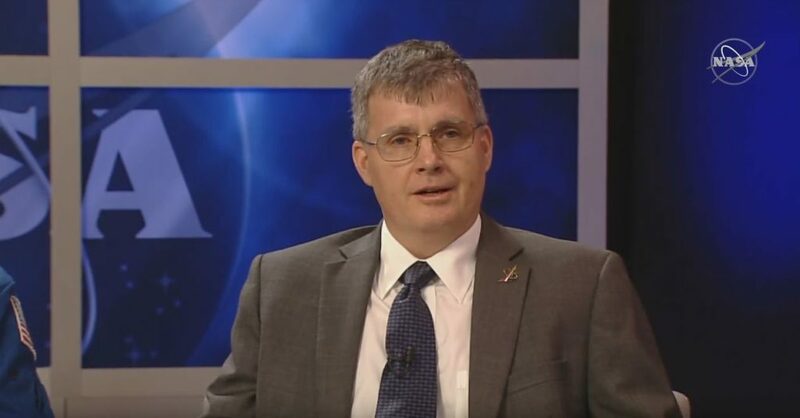 The decision to adjust the launch date was guided by limited launch opportunities in April and May, as well as a critical U.S. Air Force national security launch – AEHF-5 – atop a United Launch Alliance Atlas V rocket from Space Launch Complex 41 in June. Following the uncrewed flight, Boeing is planning to fly a test mission with crew on board to the space station in late 2019, with the specific date to be confirmed closer to that timeframe. NASA and Boeing have agreed to extend the duration of that flight test to the International Space Station after completing an in-depth technical assessment of the Starliner systems. Boeing also will fly a Pad Abort Test before those two orbital flights to demonstrate the company’s ability to safely carry astronauts away from a launch vehicle emergency, if necessary. Find a full mission and Boeing progress feature here: https://go.nasa.gov/2FM8zcQ. Following the test flights, NASA will review performance data and resolve any necessary issues to certify the systems for operational missions. NASA and Boeing are actively working to be ready for the operational missions. As with all human spaceflight vehicle development, learning from each test and adjusting as necessary to reduce risk to the crew may override planning dates. The following planning dates reflect updated schedule inputs for Boeing’s test flights as of March 26, 2019. NASA also is working with SpaceX to return human spaceflight launches to American soil. The company completed an uncrewed flight test, known as Demo-1, to the space station in March. SpaceX now is processing the same Crew Dragon spacecraft for an in-flight abort test. The company then will fly a flight test with a crew, known as Demo-2, to the station. 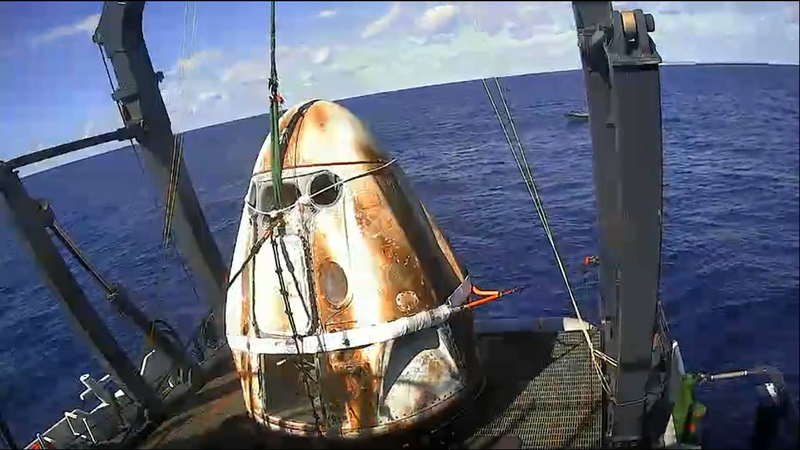 About 200 miles off Florida’s east coast, SpaceX teams have recovered the company’s Crew Dragon spacecraft from the Atlantic Ocean and lifted it aboard SpaceX’s primary recovery ship, Go Searcher. The spacecraft splashed down at 8:45 a.m. EST, wrapping up the Demo-1 flight test that began one week ago today with liftoff aboard a Falcon 9 rocket from Launch Complex 39A at NASA’s Kennedy Space Center in Florida. Demo-1 is the first flight test of a space system designed for humans built and operated by a commercial company through a public-private partnership. 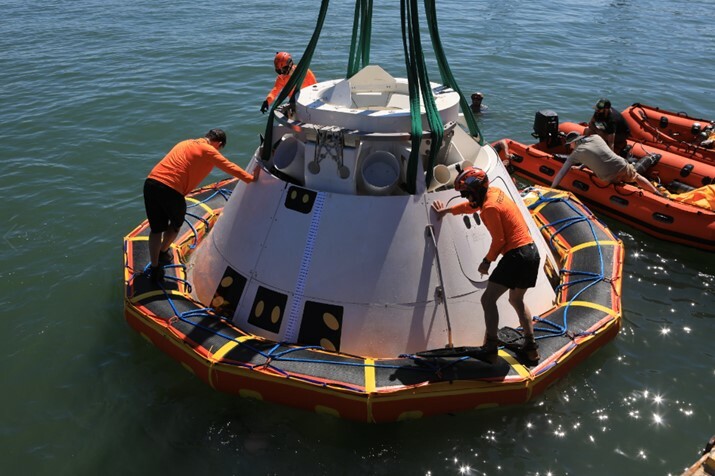 The mission also marks a significant step toward returning to the nation the capability to launch astronauts on a U.S.-built spacecraft from U.S. soil. The SpaceX Crew Dragon spacecraft splashed down at 8:45 a.m. EST about 200 miles off Florida’s east coast, returning from the uncrewed Demo-1 flight test to the International Space Station and the company’s inaugural flight with NASA’s Commercial Crew Program. 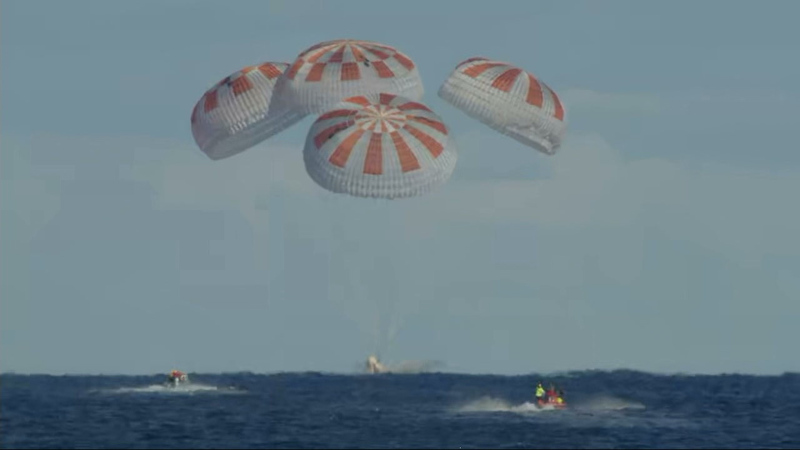 The main parachutes have deployed and are slowing the SpaceX Crew Dragon as it approaches the Atlantic Ocean about 200 miles off the Florida coast. SpaceX has two recovery ships standing by, ready to recover the spacecraft as the Demo-1 flight test comes to a close. The SpaceX Crew Dragon is making its final plunge through Earth’s atmosphere, heading toward a splashdown in the Atlantic Ocean about 200 miles off Florida’s east coast. 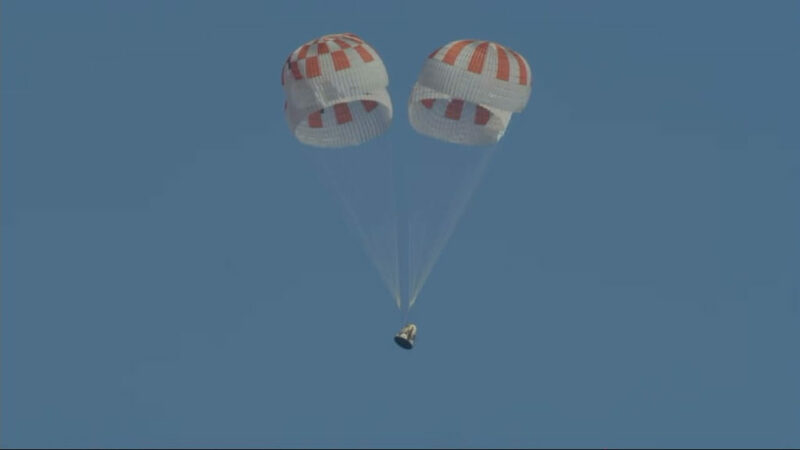 At about 8:41 a.m. EST, drogue parachutes will deploy, and the four main chutes will begin to open less than a minute later to slow the Crew Dragon during its final descent prior to its water landing at about 8:45 a.m. EST. 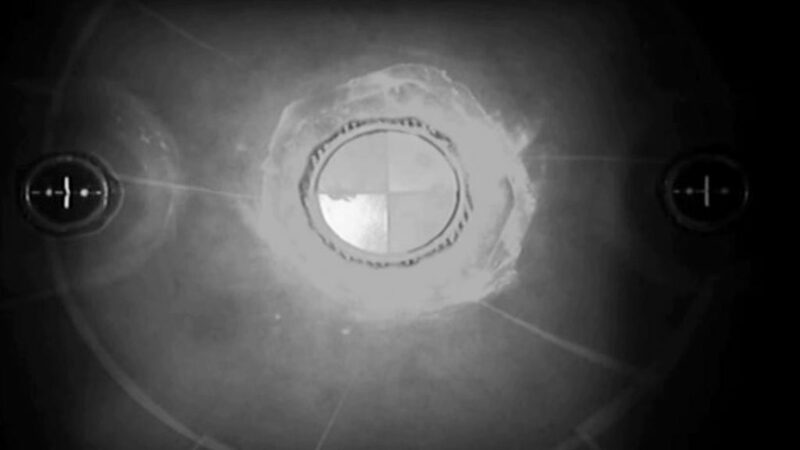 The SpaceX Crew Dragon’s nosecone has closed in preparation for re-entry. The spacecraft is on its way toward a splashdown in the Atlantic Ocean at approximately 8:45 a.m. EST. Did you know? The last time a U.S. spacecraft designed for humans landed in the Atlantic Ocean was on March 13, 1969, when the Apollo 9 vehicle and crew splashed down. 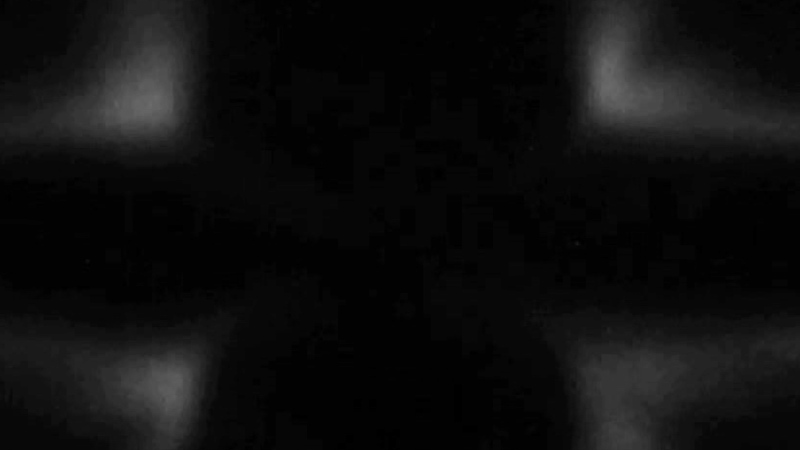 Crew Dragon undocked from the International Space Station at 2:32 a.m. EST and is on track for a splashdown in the Atlantic Ocean about 200 nautical miles off the eastern shore of Florida. SpaceX’s two recovery ships are positioned nearby to recover Crew Dragon and return it to Port Canaveral. 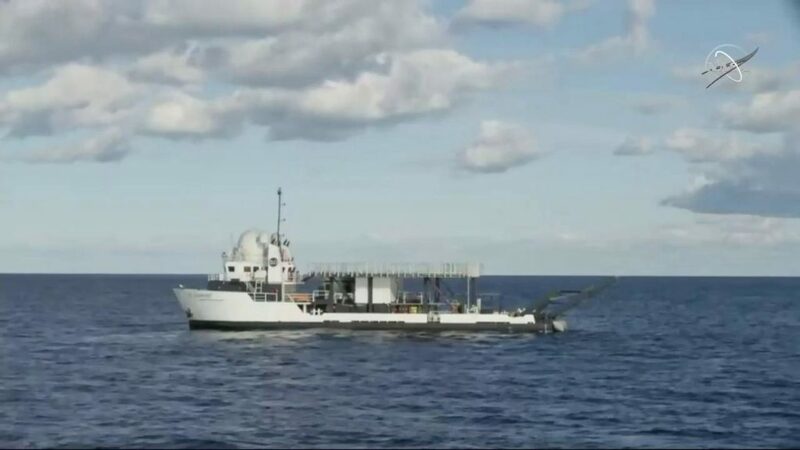 The “Go Searcher” is the company’s primary recovery vessel responsible for recovering the spacecraft. The Demo-1 mission is SpaceX’s first flight with NASA’s Commercial Crew Program. The flight test marks a significant step toward returning to the nation the capability to launch astronauts on a U.S.-built spacecraft from U.S. soil. Deorbit burn is complete and SpaceX’s Crew Dragon is on its way back to Earth. It will take the uncrewed spacecraft about 35 to 40 minutes to re-enter Earth’s atmosphere on its way to a splashdown in the Atlantic Ocean at approximately 8:45 a.m. EST. The Crew Dragon undocked from the International Space Station at 2:32 a.m. EST and is on track for a splashdown in the Atlantic Ocean about 200 nautical miles off the eastern shore of Florida. SpaceX’s two recovery ships are positioned nearby to recover Crew Dragon and return it to Port Canaveral. The “Go Searcher” is the company’s primary recovery vessel responsible for recovering the spacecraft. The deorbit burn is underway. The uncrewed SpaceX Crew Dragon’s Draco thrusters will fire for more than 15 minutes to place the spacecraft on its final re-entry path into Earth’s atmosphere. 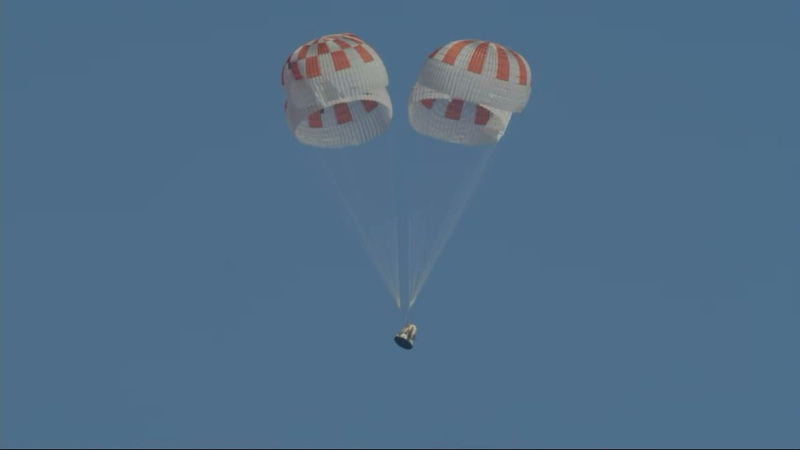 Splashdown in the Atlantic Ocean is expected at about 8:45 a.m. EST.